Beirut: On September 20th, the L’Oréal – UNESCO “For Women in Science” Levant and Egypt program honoured five Arab women researchers coming from Egypt, Iraq, Jordan, Lebanon and Syria, for their promising scientific projects. 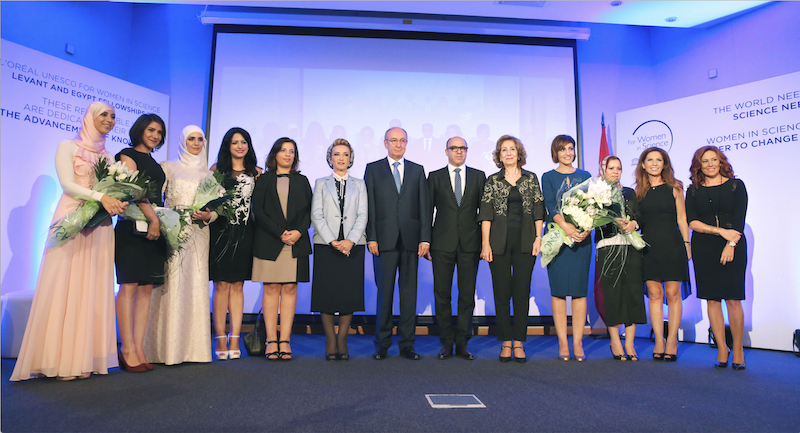 The Ceremony held at ESA Business School, was under the patronage of Mrs. Randa Assi Berri, Vice President of the National Commission for Lebanese Women, and Chairperson of the Board of Trustees at Phoenicia University and in presence of Mr. Phillippe Patsalides, General Manager of L’Oréal Levant, Dr Mouin Hamzé, Secretary General of the National Council for Scientific Research in Lebanon, and Jury President, and Dr Zahida Darwiche Jabbour, Secretary General of the Lebanese National Commission for UNESCO. Their powerful speeches recalled in front of several ambassadors, consuls, representatives of academic and scientific institutions, NGOs and media, the aim of the L’Oréal – UNESCO program, to promote the role of women in science. They focused as well on their strong Ambition to overcome barriers against women’s potential in science, and the need for further female participation. Since its inception in 1998, the L’Oréal – UNESCO “For Women in Science” program has achieved great strides. As of this year, the total number of women scientists that were honoured reached 2530 women from 112 countries, of which 2438 won fellowships. In addition, 92 women won the distinctive title of Laureate, and two among them are also Nobel Prize winners. Despite the program’s success, much is left to achieve to elevate the participation of women in science. A new initiative was launched during the ceremony, the L’Oréal – UNESCO “For Women in Science” Manifesto. This international Manifesto declares six commitments raising awareness on the importance of women’s participation in Science, promoting female leaders in this field, and tackling obstacles that continue to negatively hamper the path of women in achieving their full potential. The five women scientists were honoured all along the ceremony, and received fellowships, from the L’Oréal – UNESCO program to help them take on their promising research projects on cancer, toxicology, radiation, mycology and agriculture. Dr. Amani Al-Ghraibah (Jordan): Assistant Professor in Biomedical Engineering, Engineering College, Al Ahliyya Amman University. Dr. Ghonwa Khaddour (Syria): Water and Soil Science Researcher for the Ministry of Agriculture and Agrarian Reform, in Damascus. Dr. Mai Tolba (Egypt): Assistant Professor of Pharmacology and Toxicology, Faculty of pharmacy, Ain Shams University. Dr. Shatha Al-Taii (Iraq): Assistant Professor, Department of Biology, College of Science-Mustansiriyah University. Dr. Tamara Elzein (Lebanon): Research Associate, Lebanese Atomic Energy Commission- National Council for Scientific Research in Lebanon. To close the ceremony, the honorary certificates were handed to the five fellows, and all distinguished guests, including Mrs. Berri, Mr. Patsalides, Dr. Hamzé, Dr. Jabbour signed the Manifesto on stage. Through their signatures, the Manifesto campaign was officially launched in the Levant region and Egypt. Join L’Oréal and UNESCO in supporting Women in Science, visit www.fwis.fr and sign the Manifesto.